Exoplanet Gliese 581g is back, and “officially” ranking #1 on a list of potentially habitable worlds outside of our solar system thanks to new research from the team that originally announced its discovery in 2010. 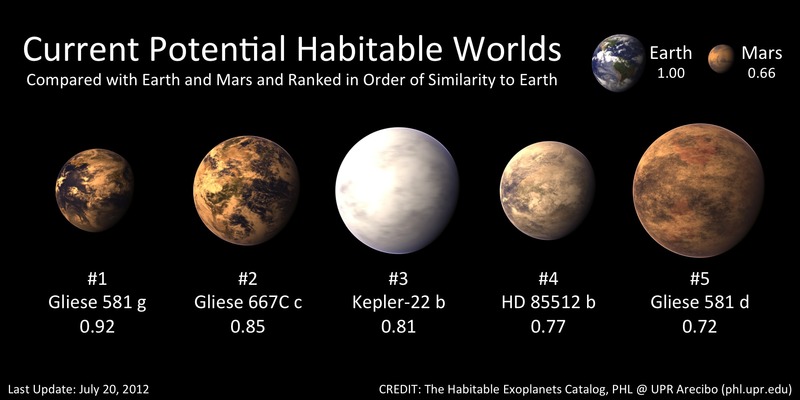 Orbiting a star 20 light-years away, the super-Earth is now listed alongside other exoplanets Gliese 667Cc, Kepler-22b, HD85512 and Gliese 581d in the University of Puerto Rico at Arecibo’s Habitable Exoplanets Catalog as good places to look for Earthlike environments… and thus the possibility of life. First announced in September 2010 by a team led by Steven S. Vogt of UC Santa Cruz, the presence of Gliese 581g was immediately challenged by other astronomers whose data didn’t support its existence. Vogt’s team conducted further analysis of the Gliese system in which it appeared that the orbits of the planets were circular, rather than elliptical, and it was in this type of scenario that a strong signal for Gliese 581g once again appeared. Read: Could Chance For Life on Gliese 581g Actually Be “100%”? “This signal has a False Alarm Probability of < 4% and is consistent with a planet of minimum mass 2.2M [Earth masses], orbiting squarely in the star’s Habitable Zone at 0.13 AU, where liquid water on planetary surfaces is a distinct possibility” said Vogt. And, located near the center of its star’s habitable “Goldilocks” zone and receiving about the same relative amount of light as Earth does, Gliese 581 g isn’t just on the list… it’s now considered the best candidate for being an Earthlike world — knocking previous favorite Gliese 667Cc into second place. The announcement was made on the PHL’s press site earlier today by Professor Abel Méndez, Director of the PHL at UPR Arecibo.